Srinagar: We the SRO-202 employees, recruited after multi-tier selection process by the premier recruiting agencies of the state viz Jammu and Kashmir Public Service Commission (JKPSC) and Jammu and Kashmir Services Selection Board (JKSSB) have been victimised by the state policy makers. As per the rule 07 of this new discriminatory job policy (SRO-202), recruitment to different posts was assured to be completed on fast track basis (within 03 Months) but it took more than 03 Years to complete the recruitment process in most of the cases. Despite working on substantive posts borne on the establishment of different Govt departments, which have been created way back by state cabinet in 1970s,1980s we are only given the Basic Pay component of the salary and are denied all the allowances like DA, HRA,CCA and unfortunately even annual increments for the initial 05 long years. The Budget allocated for these posts is diverted to sectors unknown. Most of our colleagues are posted hundreds of kilometres away from the home districts in the remotest areas of the state like Tangdar, Gurez, Karna & Ladakh etc) and few others at New Delhi. Logically they should be given incentives but unfortunately have been denied even the usual allowances by the policy makers. As per the J&K Civil Services Rules-1956, every new appointee is under probation for initial 02 Years but SRO-202 employees are slapped with a 05 years long probation in violation of JK-CSR (1956) and relevant recruitment rules governing the post/service. The biggest issue faced by SRO-202 employees is that they are entitled to annual increments only from the 6th year of the service which is in clear contravention to J&K- CSR (1956). Denial of the due annual increments will have a detrimental effect on our service and pension career and will even lead to pay anomaly in future. While as a very similar fixed salary mode job policy, enacted in 2011 was scrapped by State cabinet vide its decision No. 87/06/2014 dated 21/05/2014 and Govt order No. 156 Fof 2014 dated 27/06/2014 following massive public demand. 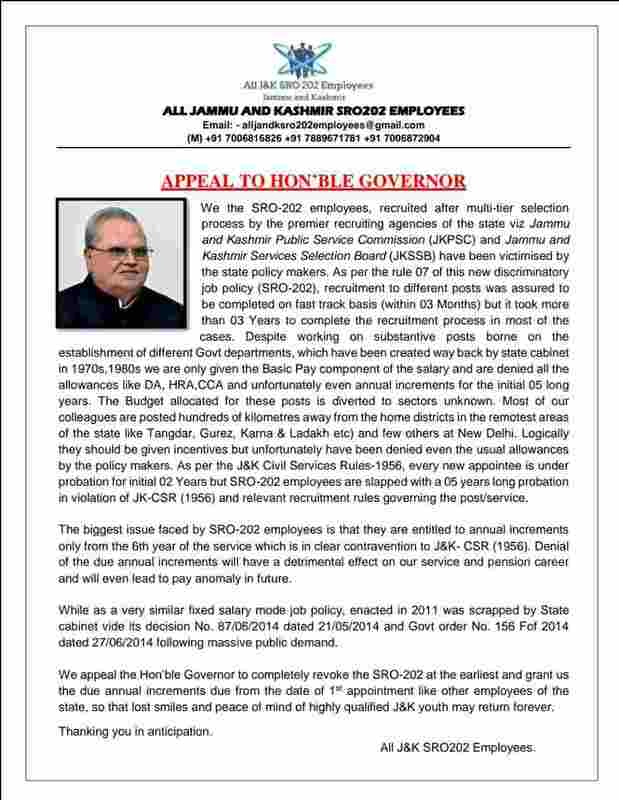 We appeal the Hon’ble Governor to completely revoke the SRO-202 at the earliest and grant us the due annual increments due from the date of 1st appointment like other employees of the state, so that lost smiles and peace of mind of highly qualified J&K youth may return forever.